12 more levels ! Come to play ! Jungle Monkey 3 is a cool running and jumping adventure game. 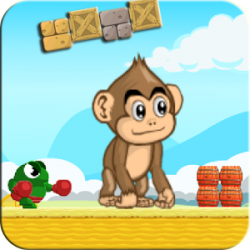 Monkey Kong is a brave, agile and lovely monkey, on a beautiful day he went into the jungle to pick up fruits.But the jungle is full of danger,he needs your help to get out. Would you like to join him to start the exciting adventure in jungle? 1 2 3 4 5 GO. 3.Run to the end of the jungle to pass the level. 3.Great pictures for the jungle and lovely animation for the monkey.